Comin’ back ‘atcha with another meal prep winner! Chicken dinner style. 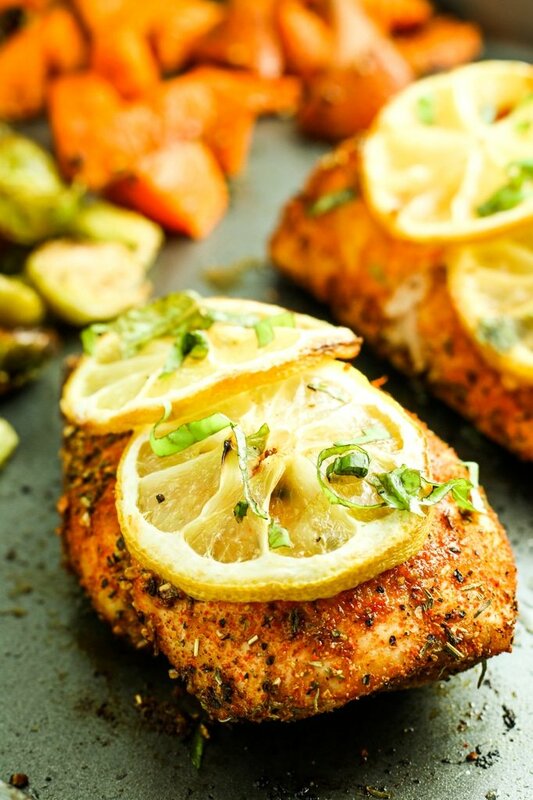  This simple meal is easy, affordable, and perfect for eating healthy even when you’re busy. Blackened chicken with the perfect amount of spice. 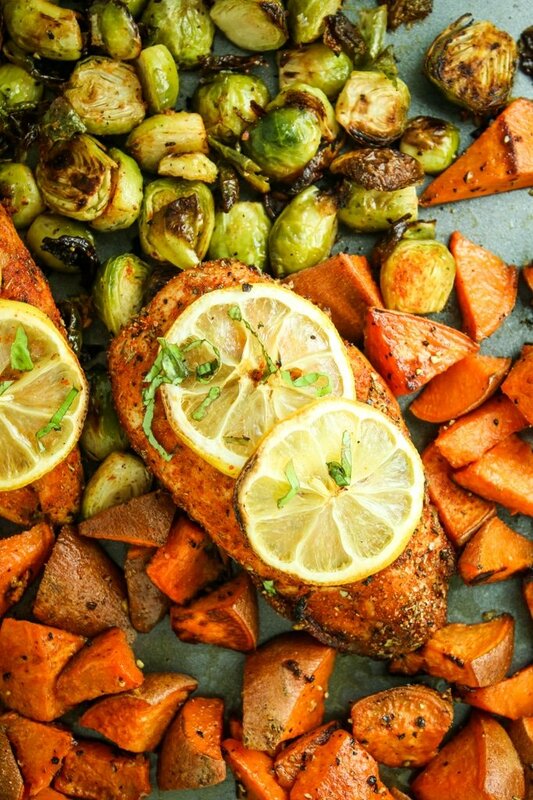 A medley of sweet potatoes and brussels sprouts. Let’s serve it all up over a bed of quinoa, shall we? I’ve tried plenty of diets. Raw vegan. Vegan. Vegetarian. Low carb. But what I’ve learned is that my body thrives on meals that are high in lean, clean protein and complex carbs. The obvious solution for my protein needs? Chicken. But when it comes to chicken, I’m PICKY. I want to know where it came from, what it ate, how it was raised (so yeah, I guess I’m basically those people in that Portlandia episode.) But in all seriousness – commercially farmed chicken gives me the creeps. My solution? Find a brand I can trust. Enter Just BARE Chicken, making the whole process easier by providing a quality product. They are committed to making good food available to more people by providing natural and organic varieties of chicken. I use their natural chicken breasts because they’re already hand-trimmed of all excess fat (less work for me!) and their chickens are raised with no antibiotics–EVER. 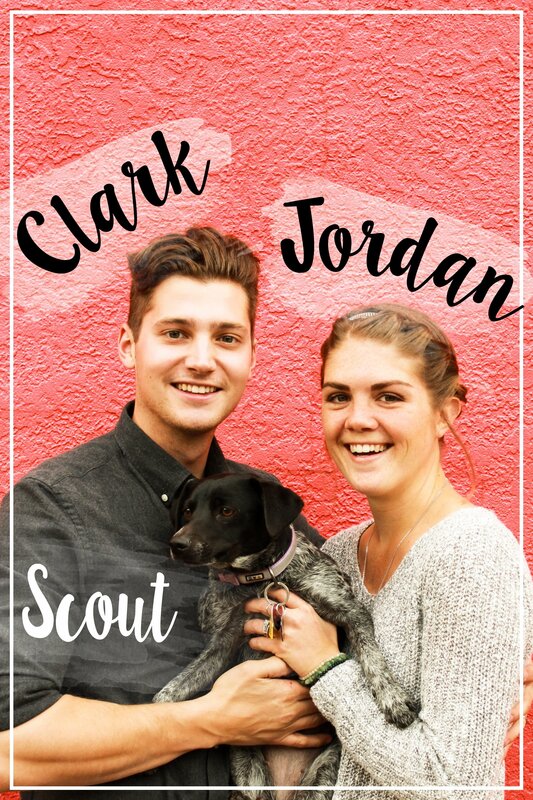 Their chickens are also traceable to individual family farms and American Human Certified. In a nutshell, I trust Just BARE’s products. They raise healthy chickens and provide me with a lean, clean protein source.   Praise be. 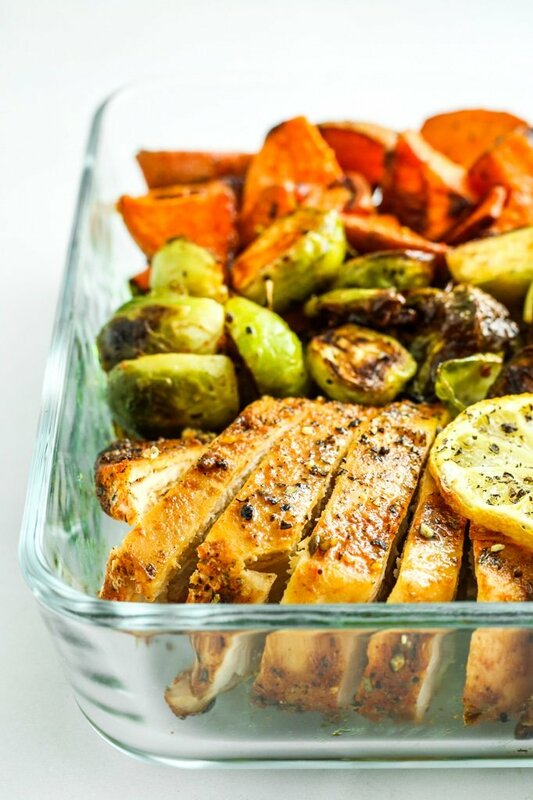 So how does this whole sheet pan dinner thing work? Maybe you’ve tried this amazing concept before or maybe you never have. Either way, it’s one of the best food concepts since sliced bread. 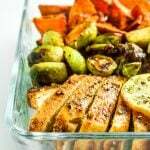 We season the chicken with a very special blackening blend (or a store-bought one, whatever), then we season the sweet potatoes and brussels sprouts. And then we put everything on the same sheet pan and set the timer. 25 minutes later, you’ve got dinner on the table (or meal prep ready for the week) and you can relax. Pat yourself on the back, friend – you have ascended to the next level of easy, stress-free cooking. 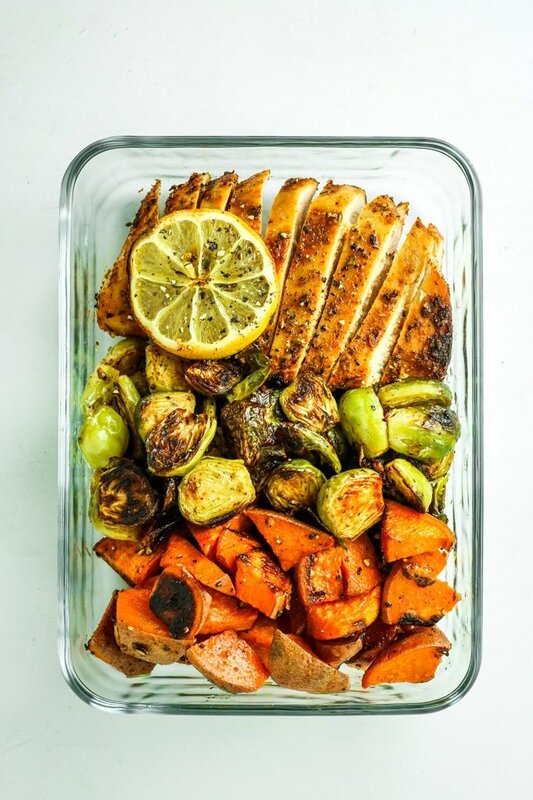 This is my favorite meal prep recipe at the moment. I usually cook a batch of quinoa or rice, then layer the veggies and the chicken over top. Full for hoursssss! When I’m feeling fancy, I shred the chicken and roll everything up into a wrap for even easier on-the-go mealtimes. Go make this and tell me what you think about it! I love when you guys share your creations on Instagram! 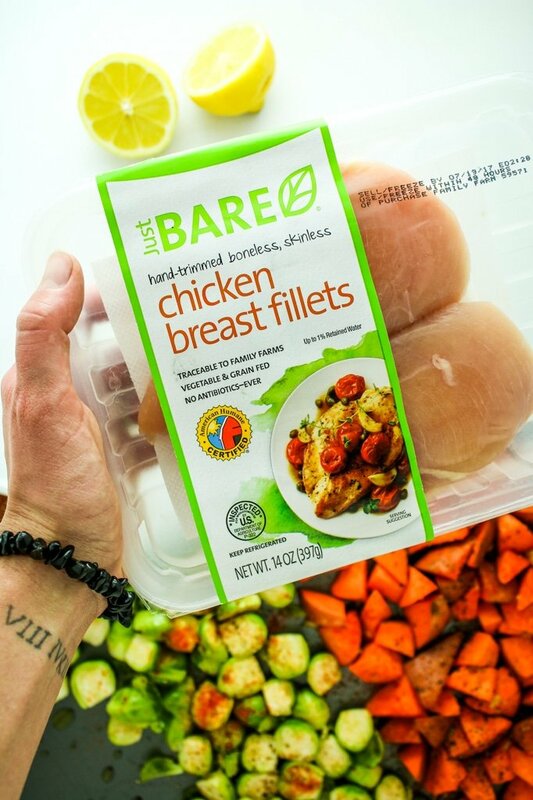 Just BARE is distributed nationwide – you can use their store locator to find their chicken near you! Wow! So good! I’ve been making an effort to eat what’s in season and this was perfect! The blackened seasoning is really good! I love eating seasonally! It makes grocery shopping easier AND less expensive. I love dinners that come together easily and with little cleanup!! Those veggies look delish! Wow! I love this so much! I love that you can have it for dinner and then have some meal prep for lunches done! This is seriously a fall dinner that speaks to me! We do a lot of sheet pan dinners with chicken, but I have only done blackened seasoning on fish thus far. I love getting blackened chicken when we go out, but always wondered what spice combo was used! this is so helpful because I”m all about making things at home! Oh my gosh, this is going into Sunday’s meal prep madness! So simple but looks so good!